A 24-year-old female patient who had no significant past medical history presented to the Internal Medicine clinic complaining of elevated home blood pressure readings. She was otherwise asymptomatic. On physical examination, there was fullness and dullness on palpation of the left upper quadrant. A comprehensive metabolic panel (CMP), complete blood count (CBC), and HbA1c were within normal limits. The tumor markers CA 125-5 and CA 19-9 were elevated. Radiographic imaging detected a large complex cystic mass arising from the spleen with significant mass effect upon the adjacent abdominal structures. The patient underwent a splenectomy and the histopathological examination revealed a splenic cyst without an epithelial lining compatible with a pseudocyst of the spleen. Ultrasound of the abdomen showed a large complex cystic mass in the left abdomen of indeterminate origin with significant mass effect upon the adjacent abdominal structures. The aorta was displaced to the right of midline and the kidneys were positioned adjacent to each other to the right of the spine in the right renal fossa without evidence of hydronephrosis (Figure 1). Contrast-enhanced CT revealed a 31 x 19 x 18 cm septated cystic fluid attenuation lesion arising from the spleen (Figure 2). The lesion contained no enhancing solid components and no peripheral nodularity. The differential diagnosis for a cystic splenic lesion includes a primary or congenital cyst, parasitic ecchinococcal disease, intrasplenic pancreatic pseudocyst, pseudocysts from splenic trauma, infarction or infection, pyogenic splenic abscess, cystic metastatic disease and cystic lymphangioma/hemangioma. Secondary splenic cysts or pseudocysts are much more common than primary cysts. The etiology of pseudocysts is usually attributed to trauma, hemorrhage, inflammation or thrombosis with subsequent necrosis and cyst formation.3,4 However, most patients with secondary cysts have no known history of trauma, significant medical illness or surgical intervention in the past. Two-thirds of all patients with cystic splenic lesions are below 40 years of age, and 80% of patients with primary splenic cysts are under the age of 20.4 Approximately 30% to 60% of splenic pseudocysts are asymptomatic, only causing problems as they enlarge.5 Common presenting complaints include left upper quadrant pain, early satiety, and nausea and vomiting secondary to compression of the stomach. The traditional standard treatment for splenic pseudocysts for splenic pseudocysts greater than 4 cm in diameter was splenectomy.2 After the 1970s, more conservative approaches were adopted due to the incidence of overwhelming life-threatening septicemia and increased prevalence of postoperative infections, particularly in children. These more conservative treatments include partial splenectomy, total cystectomy, marsupialization, and cyst decapsulation.8,9 Less invasive methods such as percutaneous aspiration or infusion of sclerotic substances typically do not result in long-term control.10 In addition, percutaneous drainage of splenic cysts is associated with a high incidence of infection, bleeding and cyst reaccumulation and injection of a sclerosant produces pain and fever with little additional benefit.4 Conservative spleen sparing surgical procedures are difficult to perform, if the cyst is oversized, covering almost the entire splenic parenchyma; is located in the splenic hilum; is covered completely by the splenic parenchyma (intrasplenic cyst), or if there are multiple cysts. 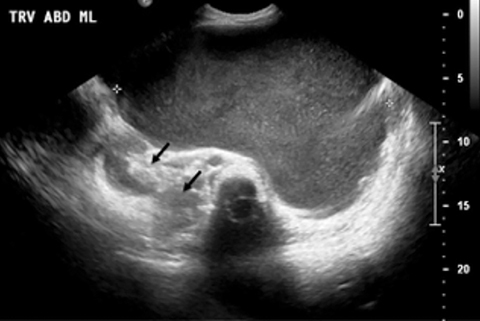 Splenic pseudocysts are a relatively rare but increasingly recognized clinical entity. The etiology of splenic pseudocysts is usually attributed to prior trauma, hemorrhage, inflammation or thrombosis with subsequent necrosis and cyst formation. The majority of patients are asymptomatic, only causing problems as they enlarge. On imaging splenic pseudocysts appear as well defined splenic cystic lesions with variable internal content with or without peripheral calcifications. Imaging plays a critical role in both diagnosis and treatment planning. Shousha S. Splenic cysts: a report of six cases and a brief review. Postgraduate Medical Journal. 1978;54:265-269. Daga G, Mittal V, Singh RJ, Sood N. Epithelial cyst of the spleen. Indian Association Pediatric Surgery. 2011 Jan-Mar;16(1):18-20. Kostka R, Vernerova Z. Post-traumatic pseudocyst of the spleen. Rozhl Chir. 2010 Sept;89:464-468. Williams RJ, Glazer G. Splenic cysts: changes in diagnosis, treatment and aetiological concepts. Annals of the Royal College of Surgeons of England. 1993;75:87-89. Labruzzo C, Haritopoulos KN, El Tayar AR, Hakim NS. Post-traumatic cyst of the spleen: A case report and review of the literature. Int Surg. 2002 Jul-Sep;87(3):152-156. Urrutia M, Mergo PJ, Ros LH, Torres GM, Ros PR. Cystic masses of the spleen: radiologic-pathologic correlation. Radiographics. 1996;16(1):107-129. Wu HM, Kortbeek JB. Management of splenic pseudocysts following trauma: A retrospective case series. Am J Surg. 2006 May;191(5):631-634. Galyfos G, Touloumis Z, Palogos K, Stergios K, Chalasti M, Kavouras N, Lavant L. Oversized pseudocysts of the spleen: Report of two cases. Optimal management of oversized pseudocysts of the spleen. Int J Surg Case Rep. 2014;5(2):104-107. Szczepanik AB, Meissner AJ. Partial splenectomy in the management of nonparasitic splenic cysts. World J Surg. 2009 April;33:852-856. 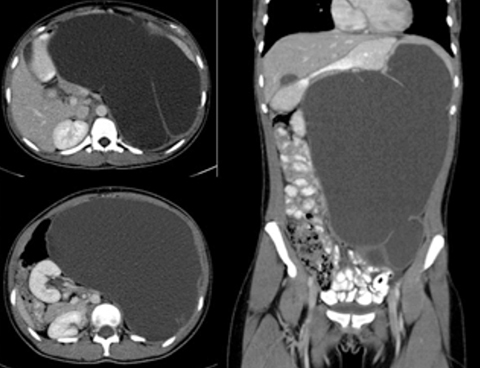 Ravera M, Cocozza E. Post traumatic pseudocyst of the spleen: case report on a conservative management through percutaneous management. G Chir. 1999 Nov-Dec;20:471-473. Rodriguez R, Silva, JM, Astani SA. Giant splenic pseudocyst. Appl Radiol. 2017;46(7):40-42. Prepared by Dr. Rodriguez while a Radiology Resident, and Dr. Silva while a Staff Radiologist at Henry Ford Hospital in Detroit, MI; and Dr. Astani while an Interventional Radiology Fellow at Beaumont Health System in Royal Oak, MI.